I don’t often go antiquing. When I do, I make a beeline for the boxes of postcards, stacks of old comic books or sheet music, bins filled with catalogs or product manuals, and piles of anything else paper-based (e.g., gum-backed stickers for now-defunct airlines, fruit box labels). Front image of a 1913 postcard purchased on 7/2/11. A patriotic scene. All rights reserved. All of these items can be classified as “ephemera.” According to Michael Twyman, librarians define ephemera as “[paper] documents that have relevance only for a short time, normally the day or days of the event or situation they relate to” . Moreover, “most printed ephemera have survived only by chance” because, at the time of their printing, they do not have–indeed, are not intended to have–importance in the long-term . Just think of the travel brochures, maps, greeting cards, store catalogs, advertisements, etc. you’ve encountered, consumed (or not), and then disposed of without a second thought. Ephemera’s initial unimportance and improbable preservation are the very reasons why I love these documents. The ephemera that survives is special, but not only because it endures through the ages; it also provides a unique narrative of the past that traditional attempts to report history sometimes cannot recreate fully. As Twyman notes, “every item of ephemera tells a story or at the very least reveals specific information about something” . For Twyman, though, ephemera are of value not only “by virtue of their content”; they are “documents with their own textual, graphic, and artifactual [sic] characteristics” . The significance of ephemera in “catch[ing] the spirit of a period” is thus two-fold: What can we learn about a historical epoch based on (1) what the document says, and (2) how it visually conveys this information? . Back image of a 1913 postcard purchased on 7/2/11. Chester's message to Sarah. All rights reserved. What stories are told by this 1913 postcard, which I bought recently at a local antique store? Click “continue” to find out. I’ll start with the tale of how I discovered it–-a story you could call “serendipity on a Saturday morning.” On the Saturday of the July 4th holiday weekend, I wandered into a local antique business that I didn’t even know existed. True to form, I found a seller’s stall that showcased mostly ephemera. My first few passes through the bins were unsuccessful, but I eventually settled on two postcards: a QSL card from Sweden and dated 1990 (not an antique in my book, but I know a ham radio operator) and a much older postcard featuring a smartly dressed woman who is waving a billowing American flag (see the first image above). The phrases “United States of America” and “Long May She Wave!” are rendered in red lettering and placed neatly at the postcard’s top and bottom margins. Perhaps having July 4th on the brain explains the latter purchase? Besides, at the bargain-basement price of $2.00, how could I resist buying this delightfully old-fashioned piece of Americana? Just a card to let you know that I am waiting for an ans. My entertaining artifact turned out to have a much more serious backstory than I originally realized, and this got me thinking about the larger historical narratives my postcard might implicate: What stories about the past do the images and messages reveal? And following Twyman’s assertion about the two-fold importance of ephemera, does the postcard’s graphic design–the way its images and messages are rendered–reveal anything significant about the “spirit” of the early twentieth century? Locating definitive answers for such questions is outside the scope of this blog post. Instead, I’ll offer questions–starting points for a historically-oriented analysis of the postcard’s content and graphic design. 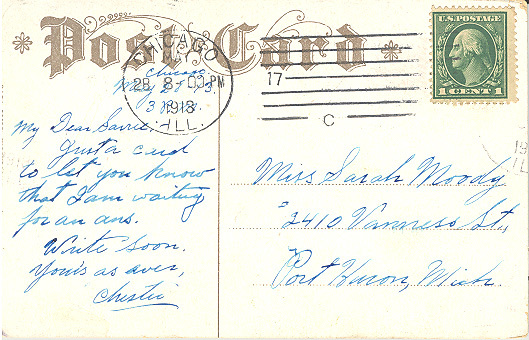 Postmark: The postcard was sent on Wednesday, May 28–two days before Memorial Day, which, in 1913, was on May 30. At this time, was Memorial Day still known as “Decoration Day”? Was sending a patriotic postcard a traditional or popular way to commemorate Memorial Day in the pre-WWI era, and if so, who was likely to engage in this activity (young people? soldiers?)? Written message: What social mores regarding courting (or even marriage proposals) are revealed by Chester’s message and the method he used to communicate it? By whom and under what circumstances would Chester’s note be considered “proper” or “typical”? Postcard as a “form” or interactive document: A form has “a clear graphic structure defined by rules” . The back of the postcard (see the second image above) reveals that the document allows little space for a message; most of the postcard’s “free” side is reserved for the addressee’s information in that the vertical line dividing the “message” and “address” sections is not in the middle of the document. Following this observation of the postcard’s graphic structure, how were postcards viewed in the 1910s as a means of communication? Why would one send a postcard, and what could one say, given the constraints of the format? Printer’s mark: A printer’s mark can be viewed on the left-hand edge of the postcard: Th. E., L. Theochrom Serie 1078. “Th. E., L.” stands for Theodor Eismann, a German printer who may have moved part of his business to the United States around 1910–a few years before WWI would initiate a very strong tide of anti-German sentiment in the United States. Was Eismann a large producer of postcards in the U.S? Were Germans, for that matter? If yes, how did WWI impact the postcard industry and the consumption of this commodity? Printing process: What printing process was used for the postcard? Why was this process (“theochrom”?) selected? (Was it economical, fast, durable, etc.?) Did other postcard printers use a similar printing process? Examining the printing process selected might help to answer questions I raised about the popularity of postcards in the early twentieth century. It seems, then, that the postcard’s content and graphic design are promising sites of inquiry regarding early-twentieth century American fashion, social mores, modes of communication, and the printing technology that underscored the exchange of postcards (a mediated, informal mode of dialogue). While these grand, historical narratives are fascinating, I’m most intrigued by the postcard’s personal dimension: the story of Chester and Sarah. I want to know more about their lives. Chester was waiting for an “ans. .” Was he referring to a marriage proposal, and did Sarah respond with a “yes”? After they were married, did he enlist in the war effort, and did he survive to witness Armistice Day in November, 1918? I hope Chester and Sarah had a long, happily ever after. Twyman, Michael. “The Long-Term Significance of Printed Ephemera.” RBM: A Journal of Rare Books, Manuscripts, and Cultural Heritage. 9.1 (2008). 19. Web. 4 Jul. 2011. —. “The Long-Term Significance of Printed Ephemera.” RBM: A Journal of Rare Books, Manuscripts, and Cultural Heritage. 9.1 (2008). 20. Web. 4 Jul. 2011. —. “The Long-Term Significance of Printed Ephemera.” RBM: A Journal of Rare Books, Manuscripts, and Cultural Heritage. 9.1 (2008). 25. Web. 4 Jul. 2011. —. “The Long-Term Significance of Printed Ephemera.” RBM: A Journal of Rare Books, Manuscripts, and Cultural Heritage. 9.1 (2008). 30. Web. 4 Jul. 2011. –. “The Long-Term Significance of Printed Ephemera.” RBM: A Journal of Rare Books, Manuscripts, and Cultural Heritage. 9.1 (2008). 57. Web. 4 Jul. 2011. –. “The Long-Term Significance of Printed Ephemera.” RBM: A Journal of Rare Books, Manuscripts, and Cultural Heritage. 9.1 (2008). 39-41. Web. 4 Jul. 2011. ‹ Want to Break that Bad Habit? Listen to William James. She did not marry Chester, it seems. Thanks to my Wallgren relatives for this information and to my Rubens relatives for sending my blog post to them! So cool. I wonder how antique today’s things will look in 100 years. I know! It’s a strange thing to ponder. Also, I wrote a postcard a few weeks ago (two, actually), and then I thought of all the postcards I’ve written over the years. I wonder if any will be around in 2112, and what will people think of my message? I love to thrift shop and things like this both intrigue me and make me a little sad. As a knitter/stitcher/sewer I especially ponder the pieces of embroidery and other handmades that find their way into thrift shops. Who made them? Why weren’t they kept? How could something that took so much time to create be tossed aside? Were they unappreciated gifts? Reminders of unliked relatives? I always look at the ephemera (post cards, especially) in antique stores because it’s so affordable. I think I got the post card in this blog post for a few dollars! Also, there’s an antiques bazaar near a favorite/family beach destination in New Jersey. In the past, I found a few postcards of Atlantic City and other NJ beach destinations from the 1910s, and I had them framed in a collection using a coupon from Hobby Lobby. I like that I can own a little piece of history for a small price, and if I can make it into a budget-friendly wall hanging, well, then, that’s a bonus!